The Independent National Electoral Commission (INEC) says it will grant visitation rights to observers for the 2019 elections. 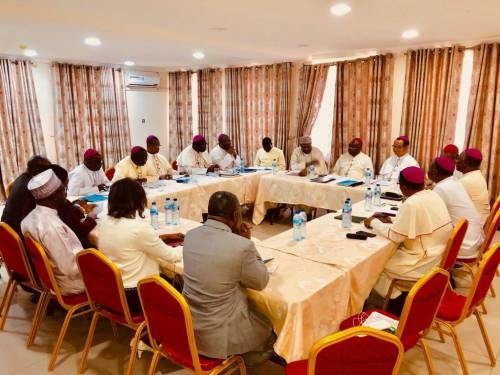 This was disclosed by Professor Mahmood Yakubu, the INEC Chairman, at an interactive meeting with the administrative board of the Catholic Bishops’ Conference of Nigeria (CBCN) in Abuja on Thursday. “We will give visitation rights,” he added. The meeting with bishops was part of the commission’s nationwide consultation with stakeholders on its readiness for the elections. Yakubu gave a detailed background of the measures already put in place to ensure a successful outing, noting that the commission was determined to improve on the gains recorded in the 2015 elections. He debunked media reports making the rounds about the alleged centralisation of the recruitment of Collation and Returning Officers for the elections, stating that there was no basis for the allegation in the first place, since Resident Electoral Commissioners (RECs) had never handled the recruitment of such officers. He also noted that the responsibility of cleaning the voters’ register was not INEC’s alone. He said while the law requires the commission to paste the register at each polling unit nationwide before the general election for claims and objections, Nigerians and political parties also owe it a duty to draw the commission’s attention to the names of ineligible persons for rectification. He said: “We have been doing so consistently. After the last one, we received only a few comments from the states; I think 48,000 out of 84 million registered voters. Part of the difficulty is that we are very careful if someone says that one person is dead, because of the experience the Commission had in 2015. On the National Collation Centre, he added: “What is a situation room? It is a place where we have our social media platforms, call centres where we take calls to listen to complaints people might have, details of the situation on the field, and so on. It is a very boring place. “Since the perception is that we might be up to something, which is why (according to the narratives, the commission is unwilling to open up the place), we have decided to open up the situation room. We will give visitation rights.